Thinking about getting out for a cycle to explore new places with your child? Or you bought a new kid’s bike, salvaged one from the shed or borrowed one from a friend to get your child cycling? Whether new to cycling, looking to cycle to school or wanting to explore new places by bike with family and friends, Bikeability Scotland cycle training will give your child skills and confidence to cycle safely and become a biking expert. Bikeability Scotland is managed by Cycling Scotland on behalf of the Bikeability Scotland Delivery Group. It's the modern day form of cycling proficiency, a national scheme designed for delivery within the school setting. It comprises of 3 main levels aimed at supporting the next generation of confident and responsible cyclists. Bikeability Scotland instructors play a hugely important role in getting kids into cycling, thereby encouraging them to choose a healthy, environmentally-friendly, and fun mode of transport. 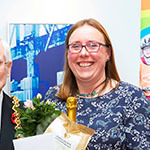 You don't need to be an expert cyclist to become an instructor - anyone with experience and confidence riding a bicycle can train to be an instructor. 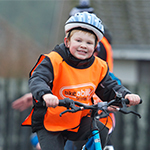 Bikeability Scotland is a cycle training programme, usually delivered in schools between P5 and S2, that teaches children to cycle safely, to learn how to deal with traffic and that, above all, gets children excited about cycling. Most Bikeability Scotland training is delivered in schools. The training is usually delivered by either a member of staff at the school or a volunteer. The support of Bikeability Scotland instructors is key to the creation of the next generation of confident and responsible cyclists. Without our instructors, many of whom are volunteers, cycle training would be beyond the reach of many primary schools, and pupils would miss out on learning a valuable life skill.